3 Bedroom, 2 Bathroom beach front holiday house in Cottesloe. Enjoy an unforgettable stay at this luxuriously appointed contemporary beach house located directly opposite South Cottesloe Beach. The house is 180 sqm in size. -Complimentary starter pack of Outback Essence guest amenities supplied in each bathroom. Fragrances selected from various parts of Australia, providing guests a truly Australian experience. This property is part of the Cottesloe Beach House Stays portfolio. A standard service fee of $100.00 (including GST) is charged for each reservation. By booking through Stayz the guest agrees to the Terms & Conditions of the booking & CBHS management. Guests booking through the online payment system must complete & return a Credit card details form within 24 hours after accepting the pre-approved request to secure a booking. This property is part of the Executive Escapes portfolio. This delightful spacious house was our base for the 2019 Rottnest Channel swim. The house is exceptionally clean and well presented with fabulous views over the ocean and to Rottnest Island. Street parking was fine except on Sunday when it was very busy, yet we only had to walk a few doors back to the house. The house is located about a 15 minute walk away from shops, restaurants and bars at Cottesloe Beach and the surf club. Our stay was relaxing and refreshing. We hope to welcome you back another time soon. Thank you for your fantastic review on the Cottesloe Beach House 1! We are so glad to hear you enjoyed your stay & loved the location! We hope to welcome you back to Cottesloe another time soon! Lovely house, with an amazing sea view, great location for train to Perth and Freemantle. Walking distance to shops and restaurants. Clean plunge pool. 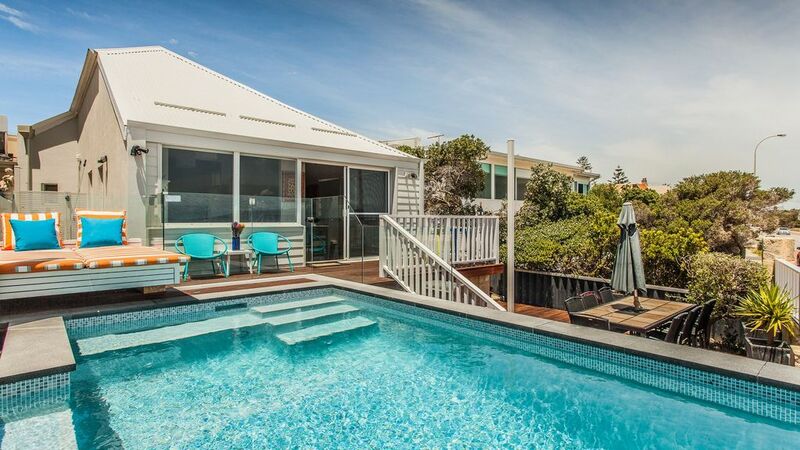 Cottesloe Beach House was perfect for 5 guests for our 4 day football weekend. The house was very well appointed and with great character. Security and facilities were all excellent. What a week to remember. My family and I stayed for week and that was to short. The location was fantastic and the property was clean and had everything that was required for a great holiday. This house was far more than any pictures could truly show. The plunge pool at the front of the house was the perfect for sunsets. I would highly recommend this property and hope to return soon. Lovely property well situated for beach and trains into Perth and Freemantle.Well equipped although a couple of loungers would have been welcomed.Maybe we will return.